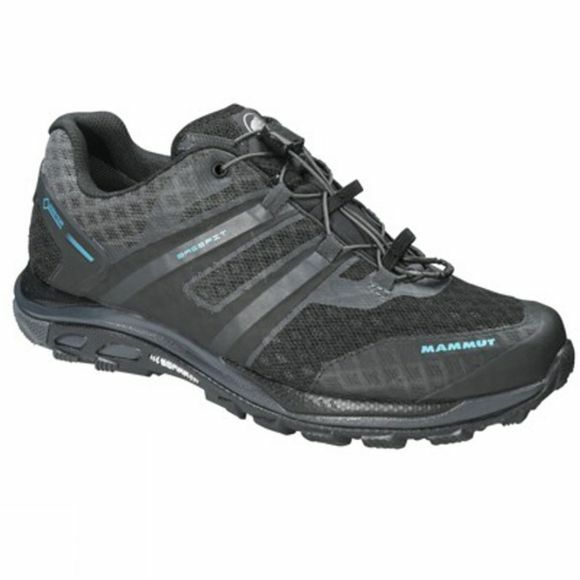 The Womens MTR 141 Pro Low GTX Shoe from Mammut is a robust training and long-distance mountain trail running shoe that provides excellent cushioning thanks to its relatively high midsole. The integrated GORE-TEX Extended Comfort membrane and elastic tongue construction offer protection from knocks, penetrating stones and damage to the material. The medium heel drop of 11mm and the patented Rolling Concept, which provides prone and supine support as needed, ensure a rounded rolling movement for mid- and fore-foot runners. The two-part gripex Sonar II outsole includes Sonar technology, which offers grip in every direction, and two rubber blends of different softnesses with integrated glass particles for reduced wear. It also includes Base Fit Advanced with improved efficiency, memo foam and the handy Advanced MTR Speed Lace System. Advanced MTR Speed Lace System.